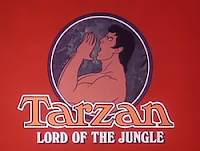 The 1976-1981 Filmation production of Tarzan, Lord of the Jungle was some of the best animation of the '70s. Many of the episodes were of the truest to the source material adaptations of Tarzan ever to be on screen. The name 'Pellucidar' is never mentioned in the episode. Really enjoyed this show, when it first came on. Don't remember this one, but it is still a great show.